I wanted poutine, that glorious (or possibly gruesome, if you’ve never had it, I suppose) combination of French fries, cheese curds and gravy, while I was in Canada; yes, I know that poutine is Quebecois but I also know that it’s available everywhere in the country. Growing up in Vancouver, even Burger King offered it. When Renée heard of my need, she directed me to Gilead Café, known throughout the city to serve a very good, but modern, poutine. We were staying a stone’s throw from the Distillery District in Toronto and Gilead Café is a stone’s throw from that, making the café just two stones’ throws from us; yes, I could drag my colleagues there one morning. I knew nothing about the cafe and even less so about Jamie Kennedy, the chef-owner. From what I can gather online, he’s quite a star chef in Toronto and he cares very much about where all the food he uses is sourced. I knew nothing of this when we entered Gilead Café for brunch that Sunday morning. The space is big and bright and I loved the walls lined with homemade preserves. Do come relatively early as we did and get seated immediately – there was a small queue as we were eating. 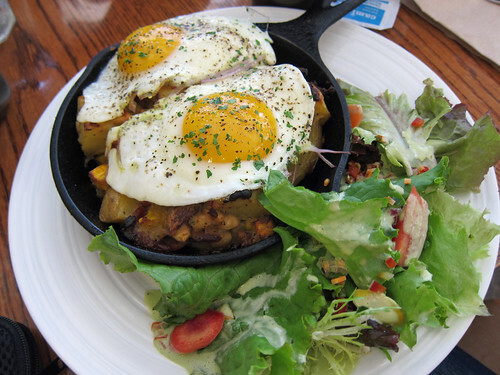 Three of us opted for the Hash with Sunny Side Up Eggs and Greens. The hash changes on a regular basis and the chalkboard indicated that today’s was going to be with succotash and bacon. Large chunks of potato were fried together with the corn and bacon mixture and served in a piping hot cast iron frying pan. It was a delicious start to the morning but I have a small quibble – I just wished the potatoes were cubed smaller, increasing the amount of fried surface area. 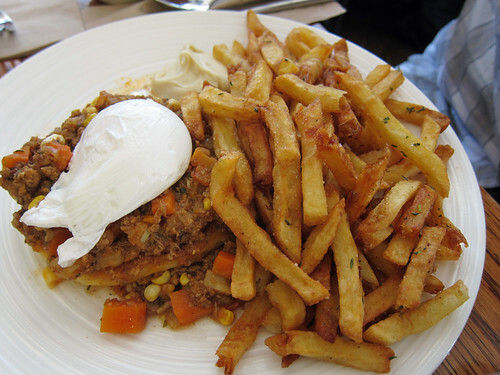 One colleague ordered the Howdy Pard’ner, an open faced Sloppy Joe with a poached egg served with fries. He seemed pleased with it. And of course, the main reason I was there, a Poutine which I ordered for the table. 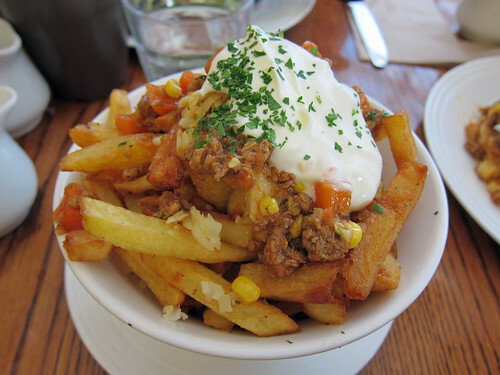 A bowlful of well-browned fries (the way I like it) came out topped with cheese and the same meat topping as in the Howdy Pard’ner (actually they had layered the ingredients, ensuring that you always get something good with your fries). A big dollop of sour cream topped it all. It wasn’t a classic poutine by any means but it was certainly very good. As you can see from this Flickr search, the toppings seem to change regularly. The pork confit version looks amazing. 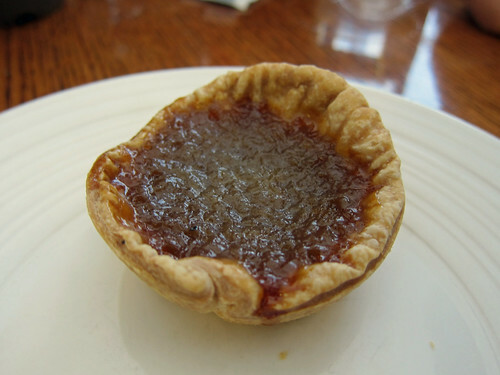 I couldn’t leave without trying one of their sweets and so bought a little butter tart to split between the four of us. It really was a very small one and so divvying it up did look a bit silly but I’m glad of just partaking in a single bite – it was ludicrously sweet. I’ve heard good things about their French toast for dessert though so that might be something to try if you’re there. The place is open for breakfast and lunch and turns into a bistro at night for dinner. And that ends my short roundup of Toronto eats – as usual, all my photos of my trip can be found in this Flickr photoset. It was a fun trip – apart from the conference I attended, I also went up the CN Tower, visited Niagara Falls (not to be missed! ), and was privileged to be invited to dinner at Shayma’s (the beautiful Shayma of The Spice Spoon). And of course, the St Lawrence Market is not to be missed, especially on a Saturday when the farmers all set up stands too. I enjoyed a delicious peameal bacon sandwich from Carousel Bakery, bought mustard from Kozliks, and shared a gorgeous wild blueberry strudel from Oodles of Strudels. Toronto is yummy. “Ordered for the table” – oh, the number of times, I’ve said those immortal words over the years! Looks like you had a great time in Toronto! Hey Su-Lin – Those eggs look wonderful! Mr Noodles: 😀 Oh yes. Hehe. Kirk: Loved their eggs. And brunches. And savoury food. But perhaps their sweets are a bit too sweet for me! This is different. i have never heard of French fries, cheese curds and gravy as a mix. This has not made it to Scotland or Margaret River in Western Australia. Benji: Poutine is fantastic. I think there might be a recipe for the cheese curds kicking about if you’d like to give it a go at home! Sophie: 😀 Any time is a good time for good fries!